We are at 779 Erie Station Rd, which is roughly at the corner of West Henrietta and Erie Station accross from the village post office and fire hall. Give the office a call at 334-4795 or drop me an email at ‘pastor at saintmarkslutheran.org’ if you need a ride to any of the services. Our time and culture is one of the customized material goods and a generalized God. What I mean by that is we can have our burger our way and get 300 formulas of shampoo, but there are no limits or descriptions that apply universally for God. The culture believes God is love and that is all. Any attempt to say something even as minimal as God is love in Jesus Christ is too restricting for many today. It limits there “searching” ability. It smack of being religious, but not spiritual. The problem with this is the revelation of God – and the only way we know anything about God is through revelation – the revelation is specific. It is specifically Jesus Christ. When we go spiritually searching we are throwing ourselves against the hidden God. That hidden God promises and delivers nothing. So we often fill it out, customize, that hidden God to our hearts content. When a church points at the very specific Jesus Christ on the cross, the revealed God, it blows away all those false hidden gods of our own making. Which is why the culture only permits a general God – don’t limit my ability to project onto my own hidden god, to search for my god. But God has revealed himself and everything that is necessary for peace. The revealed God may be humble and gory and slightly embarrassing, but He came to us, and He comes with a purpose and a promise – to reconcile sinners. Jesus, the revealed God on the cross, is the same revealed God who stopped the coronation to weep over Jerusalem. A Jerusalem that preferred its hidden gods to the very God before there eyes. There are a number of points I review and judge a sermon on. Being cut and thrust personality, I like criteria for evaluation that are as crunchy (vs. squishy) as possible. Coming out of a number of sources (CFW Walther’s Law & Gospel, Dr. Schmitt my Homiletics Prof at Concordia, Robert Dabney through T. David Gordon, St. Gregory’s Pastoral Rule and a few others) I’ve got three big criteria, and some small ones. 1. Textual Fidelity – by this I mean did I fairly proclaim the text itself or did I abuse it to serve my own ends. Given our understanding of 1st century culture (or 10th – 5th century BC for the OT) and the original language, can I accurately translate the main point of the passage especially in the larger context it is set within. 2. Evangelical Tone – by this I mean is the Gospel prevalent. Have I pointed to Christ for the listener as the savior, or have I just shown them where He is accusing them and with-held the gospel? 3. Have a Point – does what I am saying have a purpose, or is it just meaningless air. Was it the equivalent of Chinese Food and you are hungry again 15 mins later, or might the hearer think about what was said beyond the confines of the hour. Some of those smaller ones are really pre-requisites. Rhetoric and an understanding and appreciation of the audience are necessary things. We’ve all sat through sermons that were poorly delivered, didn’t move or the points didn’t make logical sense. This is usually a failure at the rhetoric level. The preacher’s toolbox wasn’t used correctly be it from lack of ability, lack of use or lack of time to prepare correctly. We’ve also all been in places where the speaker has completely missed the audience. They go on for 40 mins in a sit-com world of 15 min attention spans. The high-brow examples used with lunch-pail people, or the talk filled with emotional stories given to 50 something men. I tend to be more intellectual, so I will find myself constantly checking that audience engagement line. Do I really need to use this $5 word? Is that story or support really as logical and easy a jump as I think it is? I’m also male, so I naturally shy away from the emotional content. I find I need to intentionally ask the emotional questions to force myself to look that way. Assuming that I meet minimum standards on rhetoric and audience, then the big criteria take over. That is a large lead up for the following observation. The sermon for last week (posted under Deep Lent below) I think failed to balance textual fidelity and evangelical tone. It had a point, and it was textually faithful, but the accusing function of the law overwhelmed the hope of the gospel. It was a sermon that would have been appropriate for an audience of unbelievers, but not for the gathered church. In contrast, I believe this week’s sermon balanced things better. The prodigal son is a text that from my study last week I became convinced that most sermons are not being textually faithful. Most sermons want to use the characters as moral examples – “see, live your life this way or not that way”, or they want to proclaim the overwhelming grace of the Father. But the purpose of the text is an invite to see the world and yourself the way the Father sees it and you. It is an invite into the eschatological banquet. And that invite is a specific grace. It is not a cheap grace that just accepts you as you are. It is specific in that it requires repentance and acceptance of the Father’s view as real. I’ll just say I hated the text this week. It was harsh and rough, and I couldn’t escape it. Everything I read to prepare for preaching just lead deeper into the heart of repentance. Everything lead to heart rending stories. A better preacher would have been more winsome. Me, all I’ve got is a little logic and I’m too stupid to dial it back a bit and too slow to dodge. I hope and pray that the Spirit used this better than the words said. …The father desires for all His children to be under that protecting wing. That protecting wing that has taken care of and planned out all the necessities. 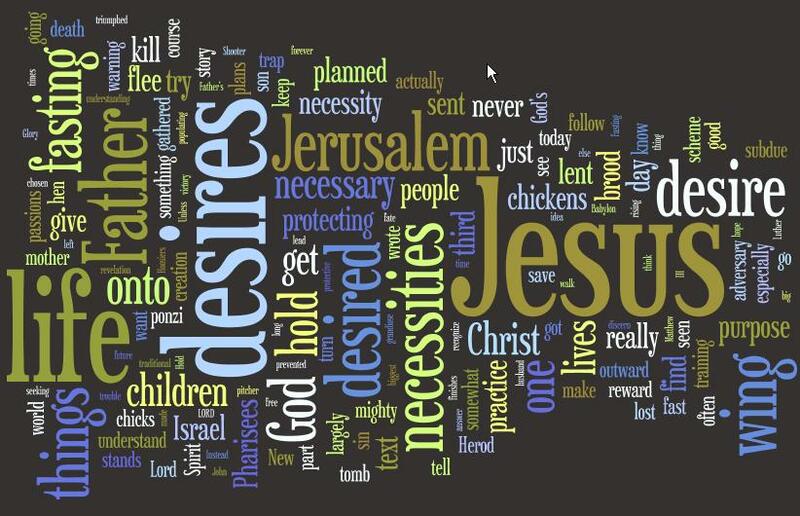 All the ultimate necessities – our sin which separated us from the Father that prevented us from being gathered, the death that results from that sin, the raging of the adversary who stands behind all the Herod’s of this world who desire to kill us – The Father has supplied all our necessities in His son Jesus. Under the cross our sins have been buried. While in the tomb – Christ triumphed over that adversary – descending into hell to proclaim the victory. And on that third day – that glorious necessary third day when the course was complete – rising from the tomb and putting death forever under his feat. God desires all his children to be under that protective wing – his mighty arm of Jesus Christ…. …That lostness in our culture. The fragmentation and the pain caused by it. The anxiousness and distrust and conflict. 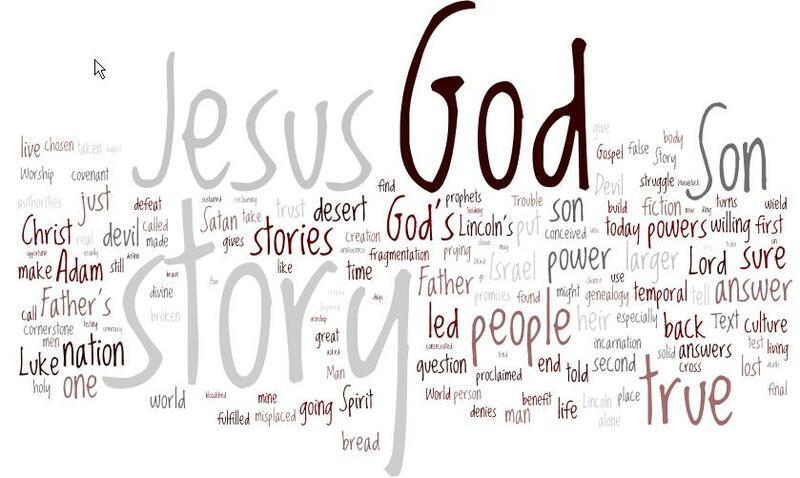 Understandable – we’ve misplaced God’s story.